Recently IT companies have announced buyback and retail investors are allured by the buyback price which is quite higher than the prevailing price at which stock is available. The most recent announcement buyback of Infosys shares at ₹1150 per share and the stock is ruling around ₹900. A stock buyback is a term used for listed companies to buy their own shares from the market using the cash generated from the business to reduce the number of shares outstanding (or floating) in the market. Buyback increases the ownership of each shareholder who doesn’t tender their shares in the buyback because the total number of shares outstanding (or floating) by the company are reduced. A company ABC has a total of 10,000 shares of ₹10 each and are traded at any price in the market. There is an investor who owns 100 shares of ABC or in percentage terms, he holds 1% of the company’s equity. Company announces a buyback of 1000 shares at a higher price than currently available in the market. Normally company announces buybacks for an amount at a given price but the number of shares company is willing to buy can be calculated. Infosys announced a buyback of up to ₹13,000 crore or 4.92% of equity share capital of the company at a price of ₹1,150 per share. 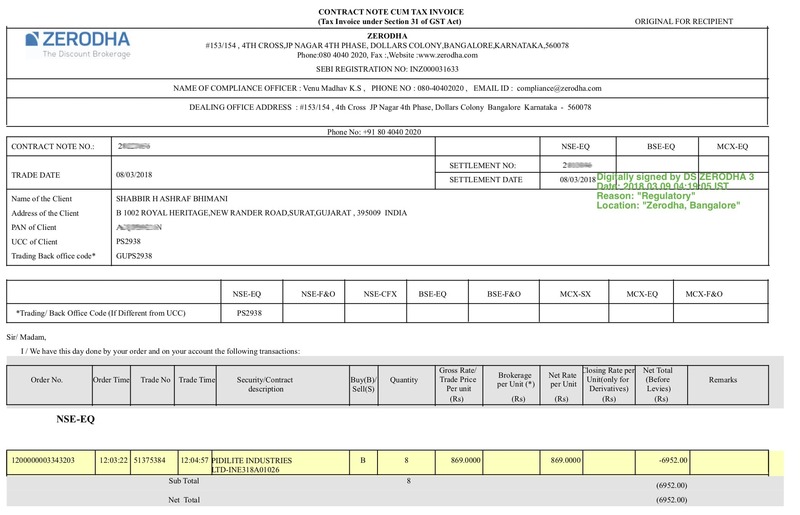 So we can calculate that Infosys will be buying a maximum of 113,043,478 shares in the buyback. Now every investor holding shares on the record date has an option to tender their shares. The tender of share is completely optional. In our hypothetical example, as the company announced a buyback of 1000 shares, the math is simple, for every 10 shares, the company will buy 1 share or an acceptance ratio if all the shares by all the investors are tendered and given equal importance to each of the investors, will be 10%. Our hypothetical investor holding 100 shares is eligible to tender 10 shares in the buyback offer. If promoters or any other large shareholder plans not to participate in the buyback, the acceptance ratio of the other shareholders can increase considerably. As an example if promoters own 60% of the total number of shares and if they don’t participate in the buyback, the acceptance ratio can go up to 25% because now out of 4000 shares available, 1000 will be accepted in the buyback. Why don’t Investors participate in the Buyback? The ownership percentage of the investor in the company increases. In our hypothetical example above, we had an investor who owns 100 shares of ABC or in percentage terms, he holds 1% of the company equity. If he doesn’t participate in the buyback, he will keep holding 100 shares of the company out of the total 9000 after the buyback offer. So his ownership will increase from 1% to 1.1%. The increase may not seem much but in percentage terms, it is an increase of 10%. So if an investor holding 4% share in the company, his shareholding will go up to 4.4% and a 5% goes up to 5.5%. No buyback participation can be a good choice for promoters and large investors to increase their shareholding in the company. How Is Buyback Different from Promoters Buying Shares? Promoters buy shares using their personal fund whereas buyback is done with the cash in the company. Promoters buy shares from the market like any other investor to increase their stake in the company. It does not reduce the total number of shares of the company like in our example above the total number of shares outstanding (or floating) were reduced from 10k to 9k. Earnings remaining constant, buyback increases earnings per share of the company because the number of shares of the company is reduced giving a boost to the EPS but promoters buying has no impact on the EPS of the company. Why so many buybacks recently? Dividends in the past have always been tax-free but in the March 2016 budget, dividend received above 10L in a financial year has an additional tax which means promoters and other large investors pay the tax on the dividend income as well. This tax is over and above the Dividend distribution tax or DDT that a company pays to pay the dividend. As a promoter holding higher number of shares, the dividend can easily get above 10L levels and is double taxed. The company pays dividend distribution tax and individuals pay the income tax. So instead of going the dividend route to return the cash to the company to its shareholders, companies preferred choice has been the buybacks. Buybacks make more sense to promoters and large shareholders whereas dividend makes more sense to the small investors who aren’t too concerned about the shareholding percentage in the company. What is Buyback record date? Shareholders of the traded stock continuously change. So the buyback record date is the date set by the company to decide the shareholders who are eligible to receive the offer. To be eligible for a buyback offer, the shares should be in the demat account on the record date. It takes 2 trading days or t+2 for shares to be deposited into the demat account and so ideally one should be buying at least 2 days prior to the record date to be eligible for the buyback. How Tender of Shares happen? The process to tender the shares can vary from brokers to brokers but a general process is an online form that needs to be filled out with a couple of options already prefilled by the broker. No of shares held on record date: Should be defined by the broker automatically. In our hypothetical example above this should be 100 for the investor. No of shares entitle for buyback: Should be defined by the broker automatically. In our hypothetical example above the investor is eligible for 10 shares in the buyback. No of shares offered for buyback: Should be filled by the shareholder. He can tender any number of shares between 1 and 10 that he is eligible for. Not filling the form means not participating in the buyback. If you are eligible for a buyback, you should receive an email with the instruction from your broker to tender the shares. There is a time limit to fill the form and submit it. The submitted details are then sent to Company’s RTA (Registrar and Transfer Agents) by the broker. Once the form is submitted, the number of shares in your demat account will be reduced by the number of shares tendered in the buyback offer and one should be able to sell off the remaining shares in the market. After the verification from RTA, the buyback amount will be credited directly to your bank account (not in your demat account). f you are eligible for a buyback in Infosys, you will receive a notification to your registered email id from the company’s RTA (Registrar and Transfer agents). My suggestion will be to know the exact process from your broker in advance. The most important part of the buyback offer is the acceptance ratio. It is the ratio of the tentative amount of shares that will be accepted in the buyback offer to the total number of shares held by an investor. The commonly used unit of acceptance ratio is a percentage. In our hypothetical example, the company announced a buyback of 1000 shares which makes the math very simple, for every 10 shares, the company will accept 1 shares in the buyback or acceptance ratio of 0.1 or in percentage terms it is 10%. The real buyback acceptance ratio isn’t that simple and SEBI orders higher acceptance ratio for small investors. Some large investor may not participate in the buyback giving higher acceptance ratio to other investors. Many calculations have shown acceptance ratio of Infosys can vary from 5% to 30%. 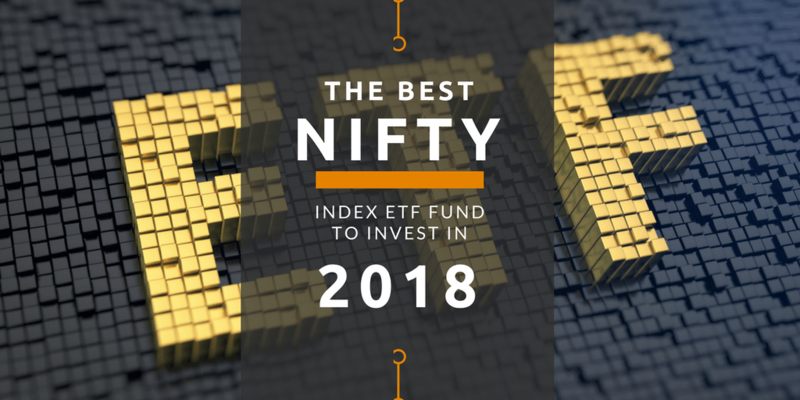 What Should Retail Investors Do? I believe companies offering buyback lack growth. It may be a general statement but I have seen it on many occasions. I follow Warren Buffet and his investment in IBM is paying huge dividends and doing buybacks worth of billions of dollars every quarter for few years. The main reason for such step as seen by many other analysts is, lack of growth opportunities by the company with the cash being generated from the business. I see the similar state for the Indian IT companies. When company outgrows the sector, it has to foray into the different sector for growth. The service-based Indian IT companies have started to see the lack of growth now and so has adopted the buyback route. As a retail investor, we aren’t concerned about the percentage ownership in the company and buyback is an early sign of lack of growth. So it isn’t advisable to be a long-term investor in such companies and tendering the shares in the buyback offer is a smart choice. How Should Retail Investor Look at buybacks? Pidilite Industries is one of the stock I hold from my open portfolio since 8th September 2016. The company came out with a buyback offer for its share at Rs.1000 per share. Here is the email with detail about the buyback offer. The arbitrage need not be only on the NSE and BSE and you can also use buybacks and open offers to cash in some arbitrage money as well. The above email is from 24th February 2018. The price of Pidilite Industries was below Rs. 1000 and so I was watching the price action of Pidilite to cash in some arbitrage money. 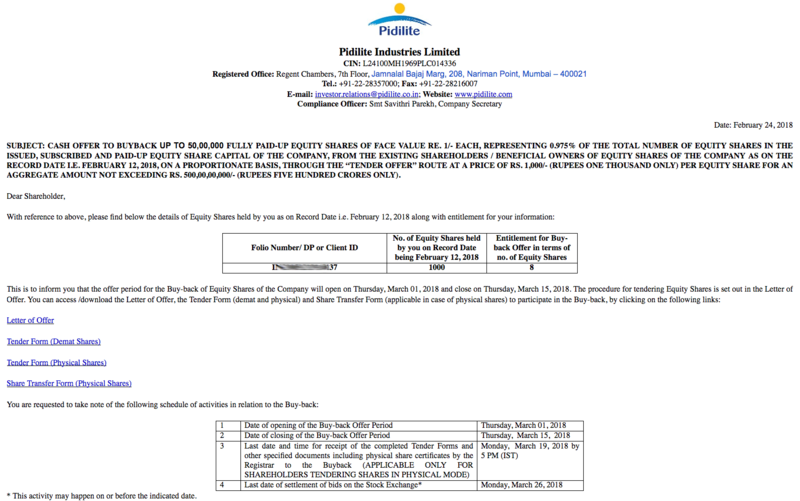 On 8th March 2018, I found the price of the shares of Pidilite went below Rs. 870. So it gave me a profit margin of Rs. 130 per share or Rs. 1000 on the total buyback. I purchased 8 units of Pidilite Industries. And tendered the 8 units that I was eligible for at Rs. 1000. 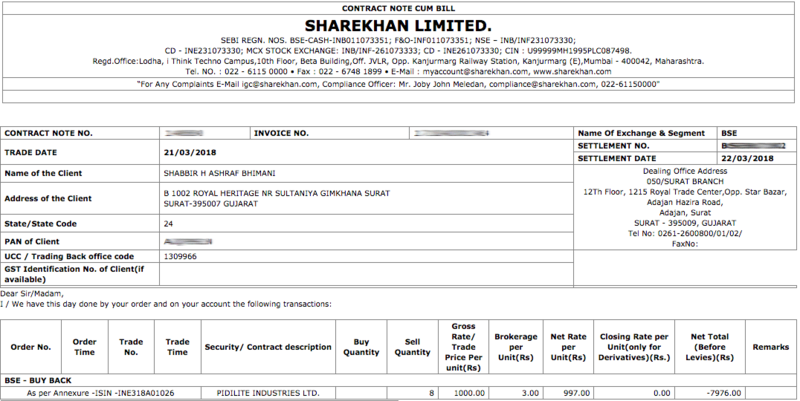 The process in ShareKhan isn’t fully online and I had to fill the form and submit it to the nearby office. In few days I had a notification that all my 8 units were accepted in the buyback offer and was sent the following contract note. The amount got credited to my bank account on 22nd March 2018. The acceptance ration in the buyback offer wasn’t very lucrative. I wasn’t willing to reduce my position in the company either. As of today I still hold the same position 1000 units of Pidilite Industries.